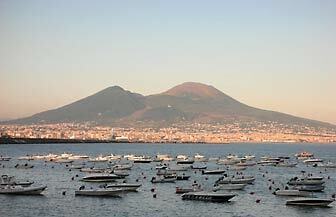 Since the first recorded eruption in 79 AD, which buried the towns and inhabitants of Pompeii and Herculaneum, Mount Vesuvius has dominated the lives of those who live on the Bay of Naples, its brooding bulk forming a stately backdrop to the ever-growing settlements that group around its lower slopes. 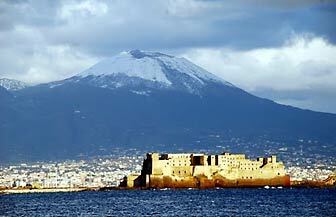 Italy's Mount Vesuvius is now the only active volcano on the mainland of Europe. 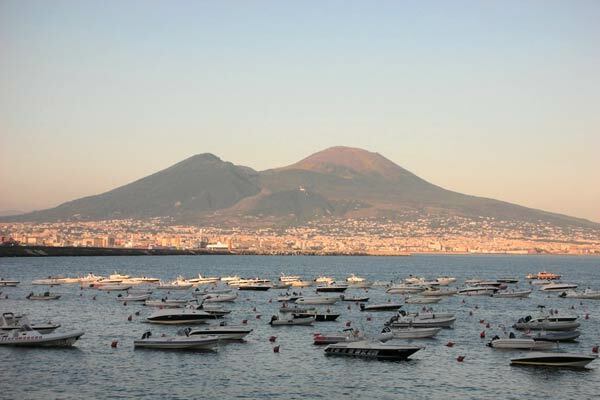 There have been more than a hundred eruptions over the years, but only two others of real significance - one in December 1631, which engulfed many nearby towns and killed 3000 people, and another, in March 1944, which caused widespread devastation. As you drive up to the summit you'll be able to see the traces of the last lava flows. 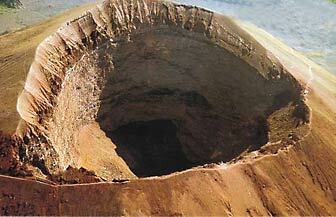 When you get to the summit, at 1277m., look into the cone of the crater to see the flat barren bottom. 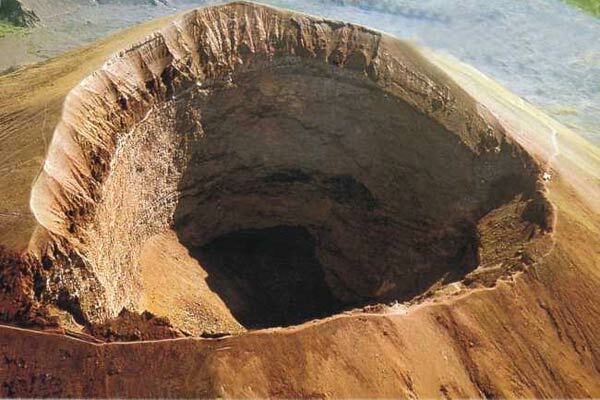 In its present state it is hard to believe that this volcano has been capable of spewing forthlava, ash, burning hot gases and debris for miles. Vapor continues to escape from cracks along the inner sides and bottom, but fencing prevents anyone from climbing inside to get a closer view. 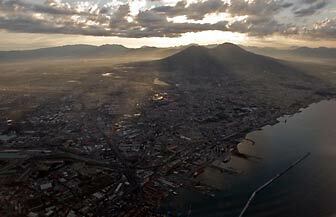 Scientists calculate the volcano should erupt every thirty years or so. 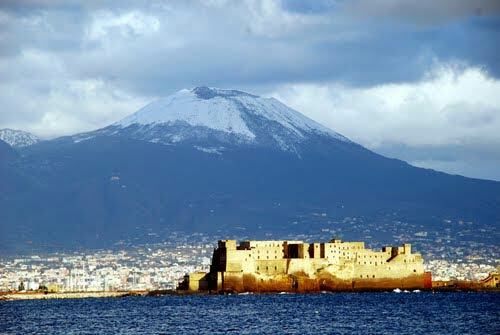 It has not erupted since 1944. It is carefully monitored, of course, and there is apparently no reason to expect any movement for some time. 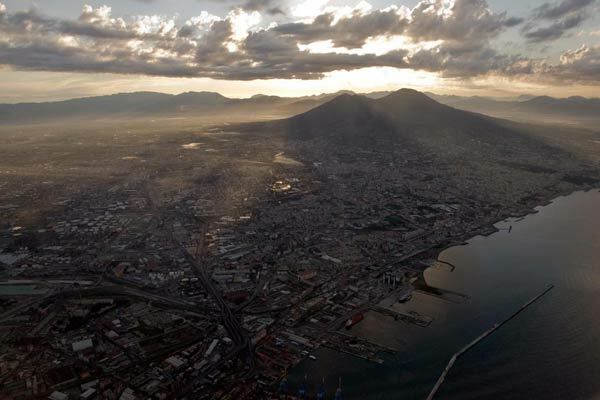 This said, the subsidence in towns like Herculaneum and Pompeii, is a continuing reminder of the instability of the area, which is also one of the most densely populated in the whole of Southern Italy.